Be prepared to love this home as you enter and experience breathtaking skyline panoramic views of Manhattan from this perfect New York City residence offering Northeast views from the 76th. 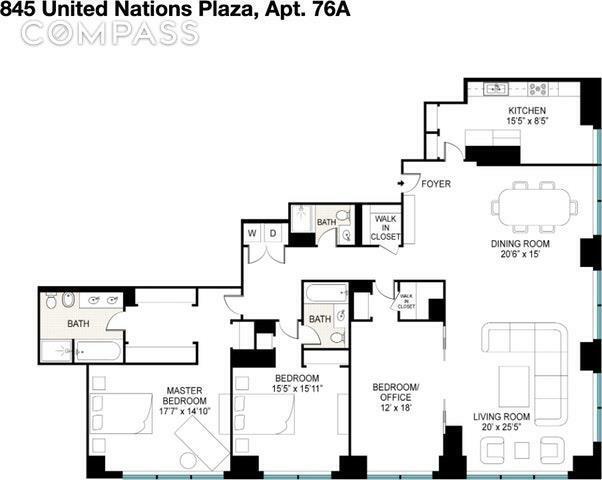 floor of the Trump World Tower Condominium. Apartment offers 2,476 square feet of flexible living areas featuring expansive living and dining rooms with 12 floor-to-ceiling windows framing your interior spaces, and giving you glimpses of some of the most iconic buildings in New York City, the East River, Central Park and the citys skyline. This home offers three bedrooms and three full bathrooms with added levels of privacy between bedrooms, and each having ample closet space with marble bathrooms and a five-fixture master bathroom. There is also a large utility closet with a side by side WD with room for cleaning supply storage, and more. The home features functional features such as inset lighting, automatic window coverings and herringbone floors throughout. This home also features a windowed chefs eat-in kitchen with Onyx counter top and floors, Viking stove with oven, Subzero fridge, dishwasher, Viking microwave, a large pantry and Rosewood custom made cabinets; kitchen area overlooks the East River and the most magnificent sunrises while sipping your daily fresh cup of coffee. 845 UN Plaza is a full-service building offering full time professional concierge services and health club facilities including a heated saline lap pool, spa, steam & sauna rooms, personal training, housekeeping, parking and wine cellar, as well as a package and cold storage rooms. The World Bar and a Restaurant are also available for all residents. Residents also enjoy the Farmers Market every Wednesday from Spring to Fall. This home offers a wonderful opportunity to own a unique 3 bedrooms/3 bathrooms residence in a fully established residential community managed by a team of caring and professional staff.